Etihad Etisalat (Mobily) officially launched the BlackBerry Bold 9700 Kingdom-wide, According to statement issued by Mobily . The “9700” is the latest HSDPA enabled BlackBerry device that runs on Mobily state of the art 3.75G network. Who would want to own a blackberry now? You need to make sure that the bb you will be buying is open line. seems a lovely phone, what would you recommend between this one and Iphone 3gs? The 9700 is a great phone. I find that it has one of the best screens when compared to other current smartphones that the market has to offer. Especially since Tazzle came out, I am really leaning towards Blackberry over the iPhone. The touch panel thing just doesn’t work for me, causing more annoyance than I need in my life. That said, I will ultimately choose whichever travels better between Asia and the US. I think Blackberry still needs some work in that department. 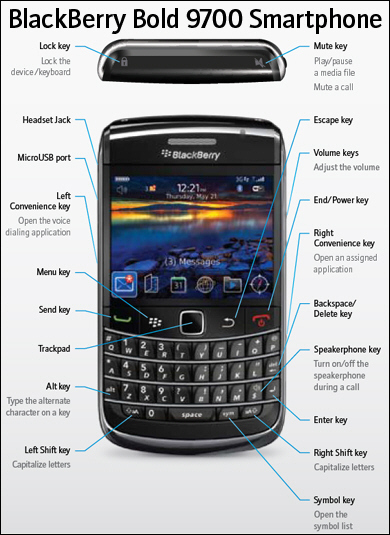 Thats a nice guide but I want to know what is the difference between the blackberry and the iphone? i prefer the iphone still though! This blackberry fever seems has been go worldwide. To be honest, I am not a fan of BlackBerry, Gphone is always my favoriate, but it is nice to know BlackBerry is becoming more and more popular, competition makes the world better. The phone just looks like any other blackberry phone! Is black berry better than an iphone?? @Francis, both have their perks, I personally find a Blackberry suits me more but it depends on many factors. You should just try looking at a model of each phone and comparing. @Francis, It really depends on how you look at it. For some its better, forothers its not. Really does depend on what you use it for. I thought that this phone was already available in saudi arabia? Its just like the story of sales for the iphone in china, they had some trouble a few weeks back. I’ve been looking into getting a Blackberry for a while, thanks for the review. I too own a Nokia e71 and when my current contract ends in about 8 months time I probably will bend towards a Blackberry as my next phone. E 71 is really a great phone.. if not because of my recent accident , I will not replace mine. How about the White BlackBerry Bold Limited Edition?